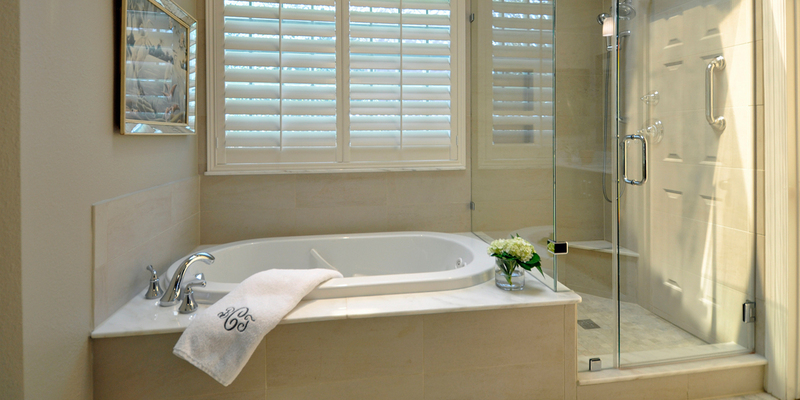 We can help you redesign your Master Bathroom into a Luxurious Retreat! Our Product Selection Process combined with our Timeline Project Management System allows us to work more efficiently in producing your Fabulous New Spa! Imagine a larger shower footprint that will give you more elbow room. Add a shampoo niche large enough to get those extra bottles off the shower floor. Include a bench you can actually sit on or maybe just a small foot bench to make shaving easier. Replace that monster whirlpool tub with a sleek, contemporary free standing soaker bathtub. Choose from Mid-Continent or Fieldstone Cabinetry to redefine your vanity and storage space in your new Spa! Convert your Hall Bathroom from a standard tub and shower curtain to a walk in shower with a bench and sliding frameless shower glass. Consider adding new Decorative ADA approved Grab Bars instead of the standard stainless steel bars. Enhance your Shower Oasis with body spray heads coming out of the walls, a rain shower head from the ceiling or an extra hand held shower head for added relaxation. Many times, a new shower faucet and new shower head is all it takes to make your shower more relaxing and refreshing! Combine Style with Substance with the vast array of porcelain and ceramic tile styles, colors and sizes found in the displays in our showroom. Your new frameless, clear shower glass will make it even easier to see the beautiful new tile layouts and designs we can help you create after you select us to be your Remodeling Contractor! Now is your chance to create the storage space you want in your vanity sink areas or your closets. Want to add more drawers? How about getting rid of that false drawer front in front of the sink? Do you have the space to add a tall unit with two small drawers and a door between two sinks? With our custom cabinetry displays from Mid-Continent and Fieldstone Cabinetry, you can find the right door style in a beautiful painted or stained finish. Granite, Marble and Silestone countertops are the most popular bathroom countertops. Why not add the same material to the top of the shower curb and top of the shower bench? Maybe make the 4” backsplash for the countertop a mosaic tile instead of the same material as the countertop? Imagine 18” x 18” porcelain tile, installed in a diamond pattern on your floor. Rectangular tile, installed in a staggered manner on the floor or the shower walls, makes a contemporary statement. With so many styles, textures and colors to choose from, you can make your own custom design statement. Our painters only paint. They don’t build fences on Monday and paint on Tuesday. They have the right brushes and the right touch to give you a professional finish. We feature Sherwin Williams Paint. We have the experience, the systems and the trades to remodel every room inside your home! With over 38 years of Remodeling and Flooring experience, Jamie and Patricia still enjoy bringing it all together to help Make Your Home Your Castle!